Dave Denniston, CFA is an author specializing working with healthcare professionals. He also serves on the Dentist's Money Digest Editorial Advisory Board. His drive to help doctors came from the birth of his youngest child, Evangeline. She is his family’s little miracle baby, born four months prematurely at a weight of 12.5 oz (3.5 oz short of 1 pound!). He has written books on a variety of subjects for doctors. Most young dentists—and some not-so-young ones—have a lot of debt, much of it from dental school. Now that you’re in your career, it’s time to start reducing your debt. Where do you start? 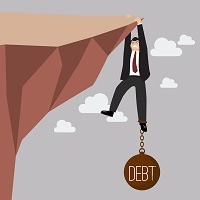 Pay off high-interest-rate, low-balance consumer debts first. Specifically, eliminate consumer debt, including credit cards, car loans, and student loans. None of these are tax-deductible like a mortgage or a home-equity line of credit. If there is a 3% or greater difference in interest rates among your loans, pay off loans with the highest interest rates. If there’s less than a 3% difference and 5 years or less to maturity, consider paying off the lowest balance loan. If you own your home, the government gives you a great deal. Interests on mortgages and home equity loans are tax-deductible on your federal income tax return—and, the rates are lower. So, if possible, move consumer debts to tax-deductible vehicle like a mortgage, assuming that you feel comfortable with your income going forward. For example, if you have sufficient equity in your home, you can open a line of credit that may have a rate of 3%. You can write yourself a check and use the money to pay off credit-card debt that may be costing you 12% or more. What’s not to like? Consolidating debt it a good idea. Outside of making minimum payments, put any “above and beyond” payments of additional principal all towards only ONE loan so that you can demolish it quickly. Don’t be passive with you debt. Analyze it and take control. Get rid of the worst type of debt first, and you’ll save a lot of money. Dave Denniston, Chartered Financial Analyst (CFA), is an author and authority for doctors providing a voice and an advocate for all of the financial issues that doctors deal with. He is the author of 5 Steps to Get out of Debt for Physicians, The Insurance Guide for Doctors, The Tax Reduction Prescription, and his new book, The Freedom Formula for Physicians. He’s glad to answer any questions about annuities or other financial matters. You can contact him at (800) 548-1820, at dave@daviddenniston.com, or visit his website at http://www.DoctorFreedomBook.com to get a copy of The Freedom Formula for Physicians. Check out Dave's podcast at doctorfreedompodcast.com/! Everyone in life faces unpredictable events, but purchasing insurance to offset all risk isn't feasible. Here's a guide to making wise insurance choices. The wealth you build up during your career can become a gift you leave to your family, but the size of that gift can be severely curtailed unless you act proactively. How you approach your patients will have a major impact on your bottom line, and on your relationships with patients. Investing in real estate can be a good way to earn income, but don't buy until you've done the math.